The American Institute of Chiropractors has recognized the exceptional performance of Indiana’s Chiropractor, Dr. Richard Busch III of Busch Chiropractic in Fort Wayne, as 2015 10 Best Chiropractors for Client Satisfaction. The American Institute of Chiropractors is a third-party rating organization that publishes an annual list of the Top 10 Chiropractors in each state. Practitioners who are selected to the "10 Best" list must pass AIOC's rigorous selection process, which is based on client and/or peer nominations, thorough research, and AIOC’s independent evaluation. AIOC's annual list was created to be used as a resource for clients during the practitioner selection process. One of the most significant aspects of the selection process involves practitioners' relationships and reputation among his or her clients. As clients should be a practitioner's top priority, AIOC places the utmost emphasis on selecting practitioners who have achieved significant success in the field of Chiropractic without sacrificing the service and support they provide. Selection criteria therefore focus on practitioners who demonstrate the highest standards of Client Satisfaction. 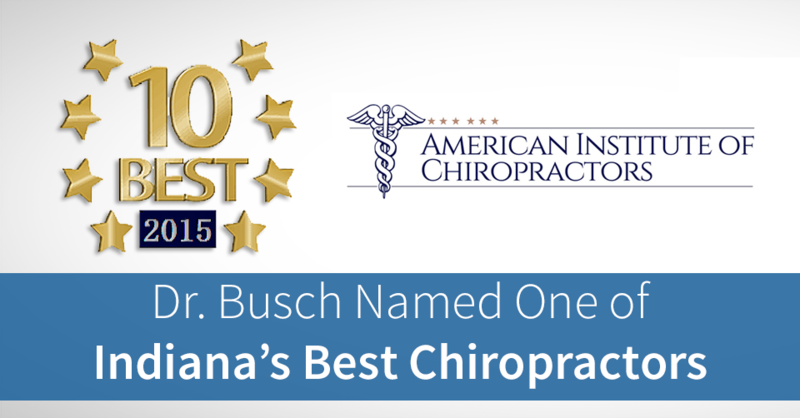 I'm honored to have been named one of Indiana's Top 10 Chiropractors," states Dr. Busch. "I have dedicated my life to helping those who are suffering with debilitating neck and back pain conditions, neuropathy, and carpal tunnel. Our nonsurgical treatments for these conditions including the DRS Protocol, spinal decompression therapy, have helped many patients relieve their pain. I look forward to helping many more patients avoid surgery and regain their pain-free lives!" In addition to this award, Busch Chiropractic was also recently named one of the best chiropractors in Fort Wayne. If you or someone you know suffers with chronic pain, call Dr. Richard Busch III at the Busch Chiropractic Pain Center at (260) 471-4090.